Once a simple festive tradition for children, the humble advent calendar has seen a complete transformation over the last few years. Gone are the days of opening a little cut-out door to reveal a tiny chocolate snowman – now advent calendars are filled with anything you can possibly think of, from bottles of gin and perfume to Lego and socks. No one expected the huge rise of fancy advent calendars, which are now a staple seasonal trend. 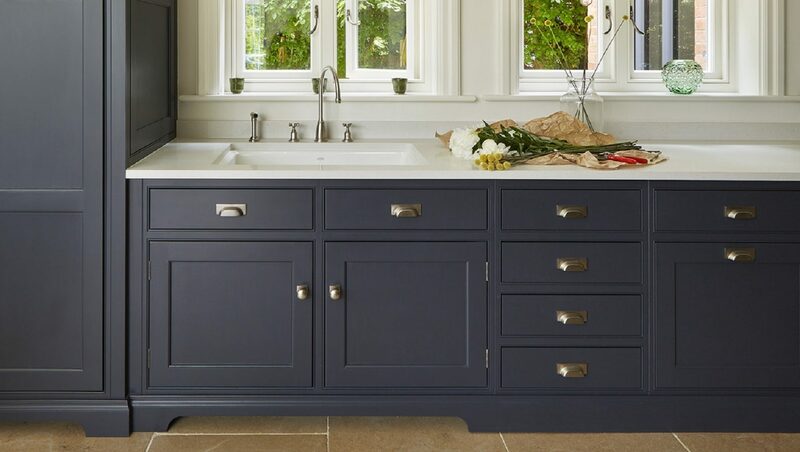 Well-known retail brands clamour to get their own products into this rapidly expanding market, with limited editions selling out online long before the Christmas TV adverts are launched. Despite the explosion of advent calendars now available, there’s no doubt about it; we still love the special anticipation of not knowing what’s behind each door. 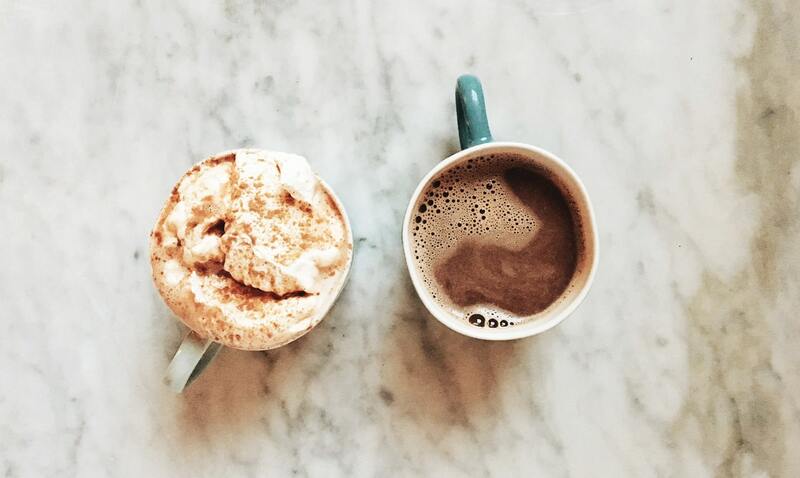 We can’t see anything wrong with starting the day off with a little surprise – after all, you deserve it. 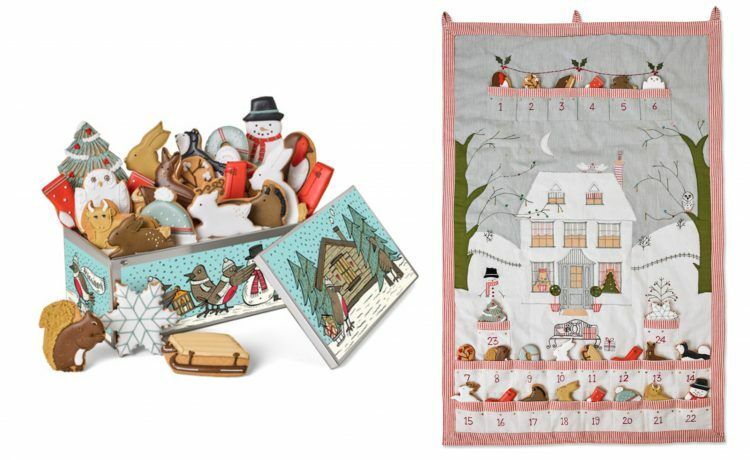 But with so many different ones out there, we wanted to see if we could hunt down some rather more refined, unique advent calendars that will bring a special something to your exciting Christmas countdown. Susanne Kaufmann launched her skincare brand back in 2003, after growing up in the Austrian alps and taking over the management of her family’s hotel business at the age of 23. She embarked on creating a modern wellness spa that offered signature beauty treatments using superior, sustainable, organic natural skincare ranges, but soon realised that she needed to develop the product line herself. 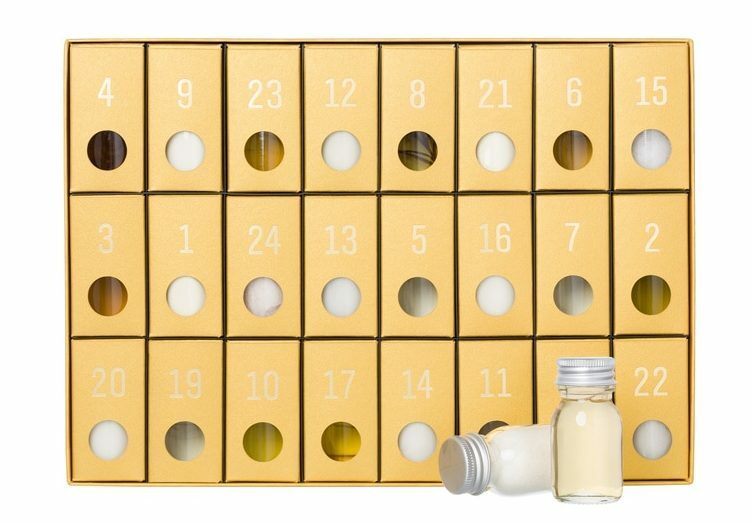 The Susanne Kaufmann Gold Holiday Calendar is exclusive to Net-A-Porter, with 24 hidden beauty products in perfectly minimalist glass vials, filled with luxury bath products, hair care treatments, skincare products and body oils. One of the most divine advent calendars available, the Diptyque Christmas Advent Calendar is a beautifully designed product with a wonderful ‘Legend Of The North’ story behind the illustrations. There are no doors; this calendar has little drawers that open to release that distinct Diptyque aroma. The calendar includes 25 scented trinkets, including 15 travel sized candles, seven fragrances, two body products and one large candle. 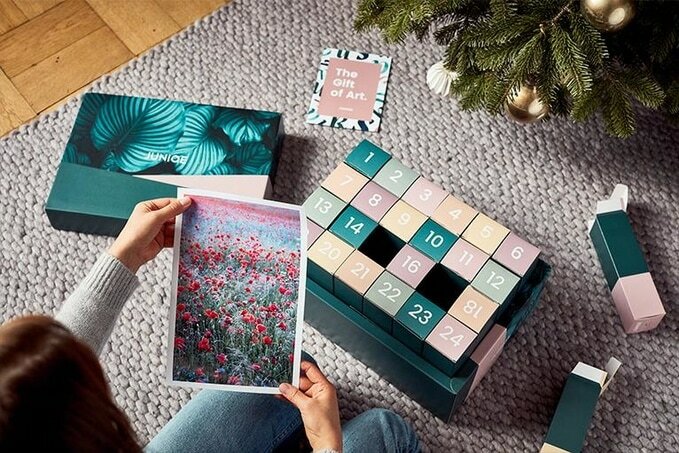 Countdown to Christmas with this unique calendar, which will continue to delight art lovers, designers, painters and culture enthusiasts long after Christmas is finished. This limited edition ‘A Poster A Day’ 2018 Advent Calendar from Juniqe features 24 boxes, each with an art poster rolled up inside. The calendar comes with an index, listing all 24 artists names, allowing you to discover new favourite artists and explore their work. 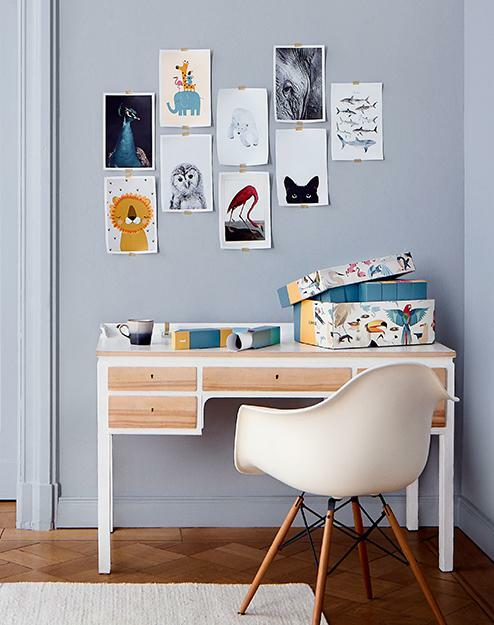 Other poster advent calendars available include Black and White, Motivating Mantras and Botanical Beauties. As part of the Balmain Paris fashion label, Balmain Hair has over 40 years of heritage in combining hair essentials with the latest catwalk trends. The collections are inspired by backstage secrets and mirror all a woman needs to create the ultimate catwalk inspired look. 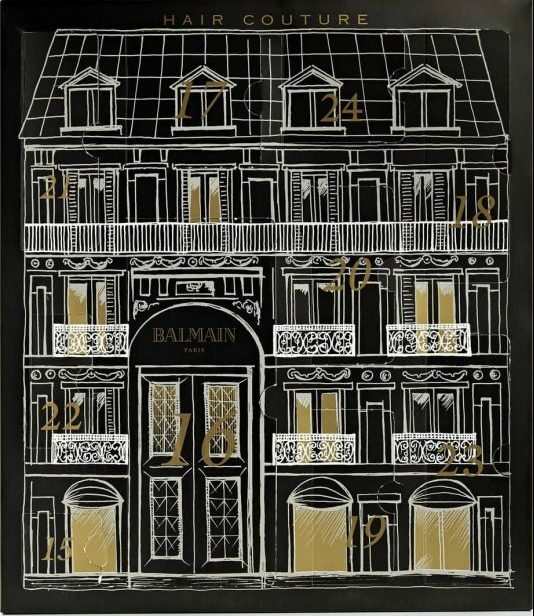 Balmain Paris Hair Couture’s ‘Gift Calendar’ is filled with 10 of the label’s favourite hair products packaged in a beautiful printed box. It’s perfect for any beauty fanatic! While we all love a classic cup of Earl Grey, there’s a lot to be said for trying something new. Award-winning tea mixologist company Bird & Blend Tea Co. believe in bringing a bit of fun and happiness to everyday life, with their quirky blends such as Mrs Claus’ Raspberry Prosecco black tea and Dosy Girl chamomile tea. 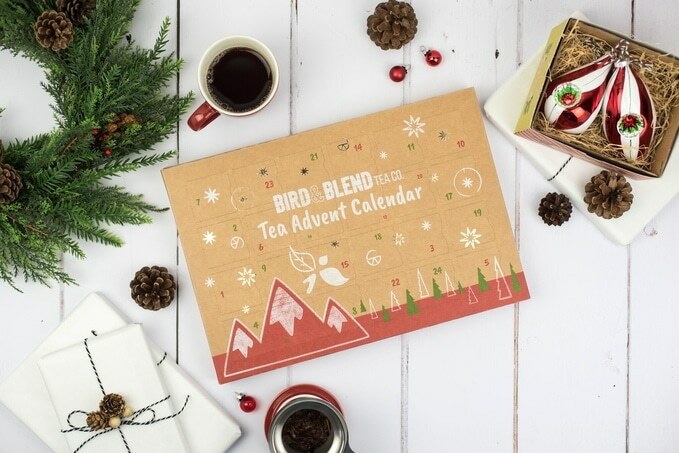 Presented in their classic home-made, craft-style box, with hints of golden foil and a smattering of festive Nordic charm, tea addicts will adore their Tea Advent Calendar. This year’s calendar has more tea on offer than ever before, plus four mini matcha tins in their best-selling flavours (Ice Cream Matcha, anyone?!). Not only that but the calendar has several mystery doors this year, featuring surprise limited edition blends as well as classics like Mince Pie & Gingerbread Chai. Finally, a surprise gift awaits behind door number 24. Tea Advent Calendar, £36.00 from Bird & Blend Tea Co.
Inveraray-based Loch Fyne Whiskies are known for their huge range of whiskies, including their own blends and malts. Their workshop and store in the high street is a treasure trove for scotch enthusiasts, with a friendly and helpful team on hand to dispense their expert knowledge to anyone who wants to know more. The Chocolate & Orange and Honey & Ginger liqueurs make excellent Christmas gifts but if you’re looking to try a bigger range, their Whisky Advent Calendar features drams from some of Scotland’s finest distilleries, along with a couple of samples from further afield. 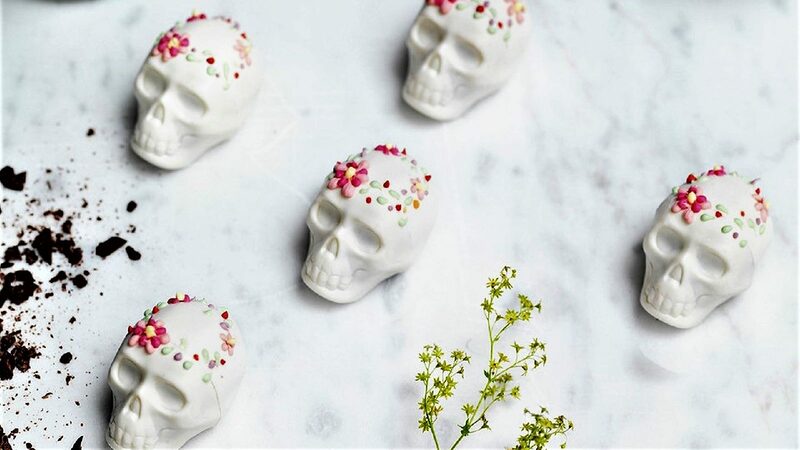 The Biscuiteers know how to make things fun! With their beautifully iced biscuits in cheerful boxes and packaging, you can send the perfect gift for every occasion imaginable. 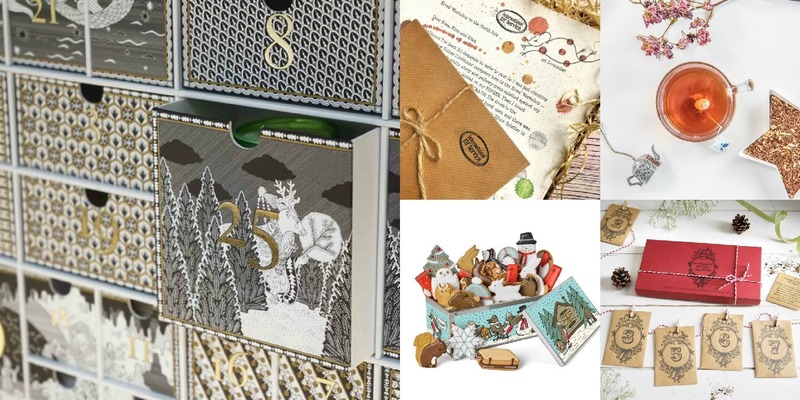 Their handmade, embroidered Limited Edition Biscuiteers Advent Calendar was designed exclusively by Susy Watson, with a cosy snow scene and 24 numbered pockets. Fill with the Biscuiteers 24-piece advent biscuit tin, which features hand-iced vanilla biscuits in the shape of Christmas trees, snowflakes, reindeer and much more. 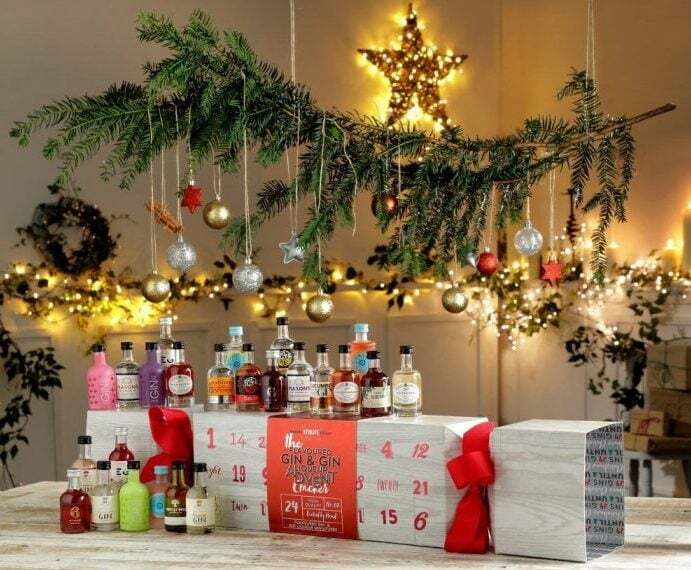 Celebrate the festive season with this jolly gin-filled Flavoured Gin and Gin Liqueur Advent Calendar from The Pip Stop. There are a few gin advent calendars out there on the market, but this was our favourite due to the range of flavours to try. Behind each door are 24 different tipples waiting to be discovered, from Sicilian Blood Orange Gin to Strawberries and Cream Gin. 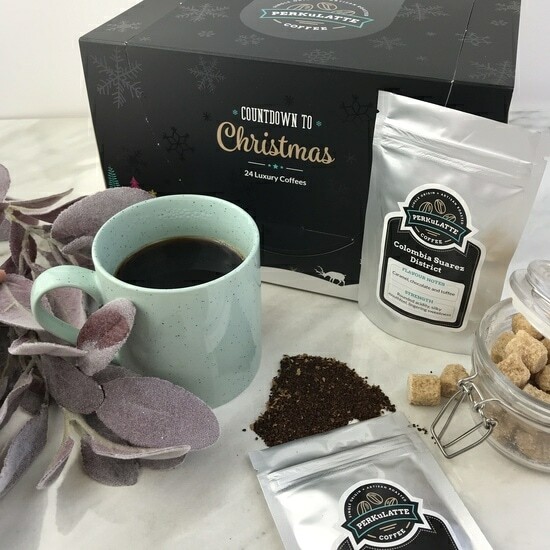 Explore different blends of special coffee in the run up to Christmas with Perkulatte’s Christmas Coffee Advent Calendar. Each of the numbered 24 bags includes 20g of fresh, artisan roasted coffee, including Brazil Villa Borguesa, Colombia Excelso, El Salvador El Molinito, Costa Rica SHB and Malawi AB Phoka Coop. This is a calendar for real coffee aficionados, as you can choose from wholebeans which you can grind down to a size of your own liking, or choose from a cafetiere grind, espresso grind, filter grind or Aeropress grind. Each pack gives details of the different flavour notes, helping to define the different tastes and blends. Prefer a darker roast over a lighter roast? No problem; Perkulatte has you covered. This exquisitely illustrated Gardeners’ Seed Advent Calendar box is perfect for green fingered garden enthusiasts. 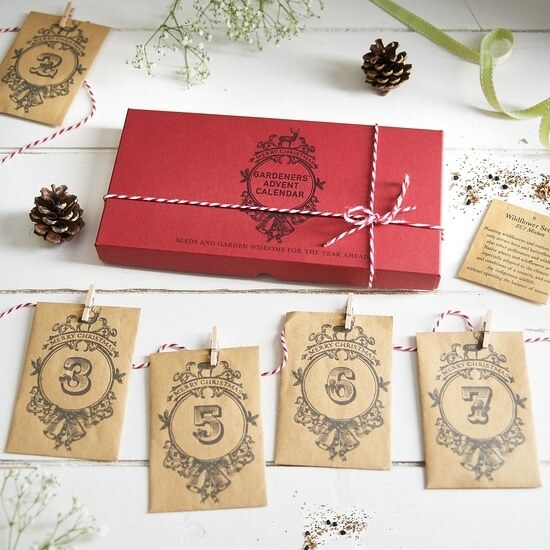 Created by Seedlings Cards & Gifts, who also make yearly seed calendars and gift cards, the calendar includes 24 numbered brown envelopes which can be hung like a garland on the red and white bakers twine provided. Each envelope contains wildflower seeds that attract bees and butterflies, plant markers, fact cards or gardening tips. Watch the garden come to life throughout the year with flowers such as Cornflowers, Forget-Me-Nots and Marigolds. Fill the festive season with a little sweetness by indulging in the brand new Bonne Maman Christmas Advent Calendar. Debuting this year in the UK, it’s the perfect way to say Joyeux Noël to loved ones during the holiday season. 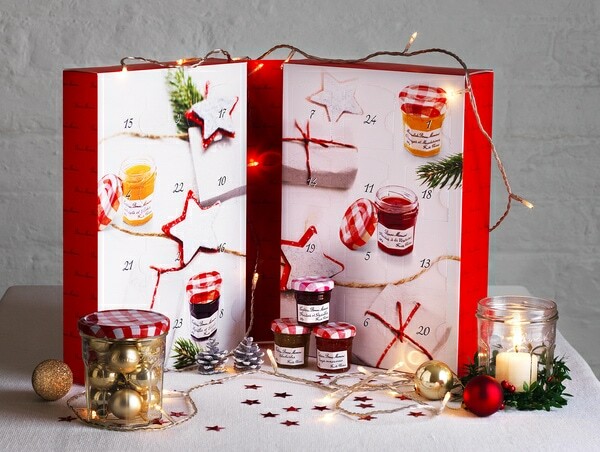 The calendar contains mini jars of jam and marmalades in delicious exclusive flavours concealed behind 23 doors, plus an extra special surprise on Christmas Eve. The 30g mini jars include a range of exciting flavours not usually available in the UK, such as Grapefruit and Dragon Fruit Jam, Purple Fig Extra Jam, Raspberry and Lychee Jam, Pear and Mirabelle Plum Jam, Orange and Cinnamon Marmalade, Lemon Marmalade, Raspberry and Redcurrant Jam and many more. Quite frankly, it doesn’t get more magical than these 25 Personalised Christmas Letters. This bundle of 25 imaginative letters are personalised to be addressed to your children, straight from the International Elf Service. The letters are written by elves who have borrowed Father Christmas’ computer, reporting back to your children on all the secrets and goings on as the North Pole prepares for the big day. Bring a touch of magic to Christmas by leaving the letters under pillows or in school bags for your children to find. 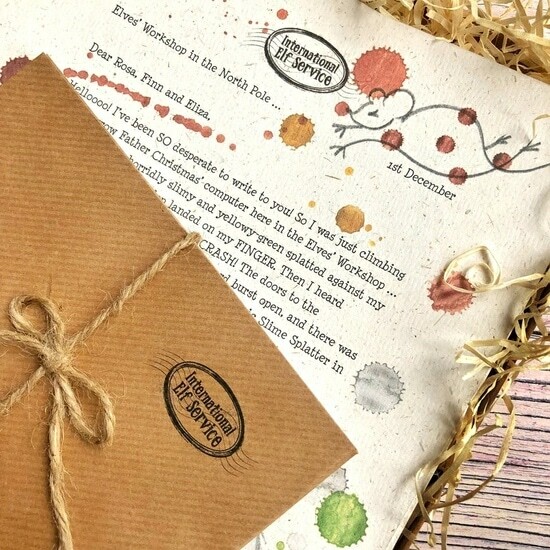 The bundle comes with a hand-drawn map of the North Pole and a certificate from the Postmaster congratulating the children for being chosen to receive the letters. 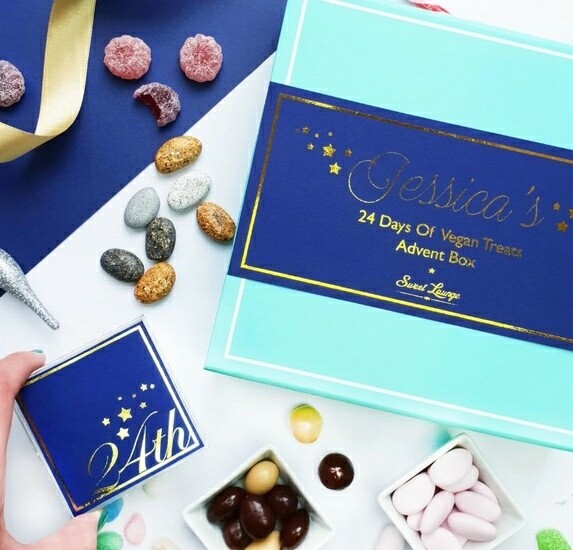 This beautifully designed Vegan Sweet Treats Advent Box from Sweet Lounge is perfect for those with a sweet tooth. You’ll find individually wrapped packets of Fruity Pillows, Italian chocolate-covered almonds, Fizzy Cherries and many more vegan treats! As a special touch, the box can be personalised with your name, and you can choose from warm gold, bright gold, rose gold or silver foil print. 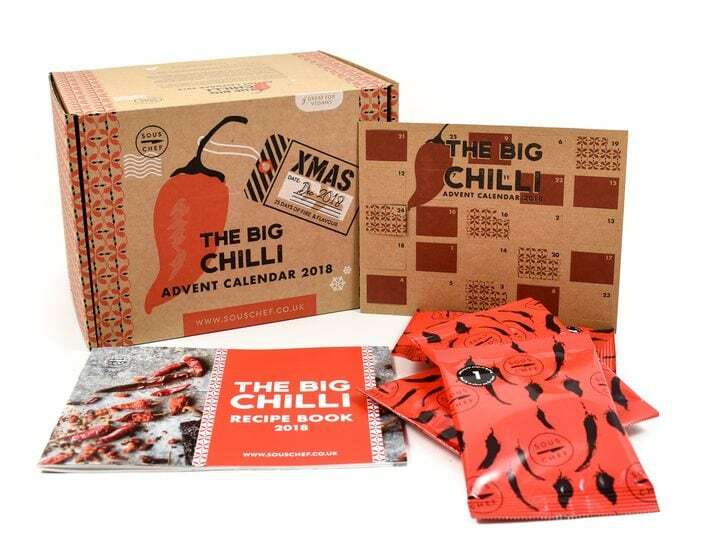 Take a trip around the world in twenty-four chillies, with the Big Chilli Advent Calendar from Sous Chef. From the world’s hottest Carolina Reaper to smokey chipotle, you’ll become an absolute chilli expert by Christmas! This cool calendar was voted no. 1 in the Telegraph’s Best Alternative Advent Calendars 2017 and the team from Sous Chef have made a few tweaks to make their 2018 calendar even better! It comes with a recipe booklet filled with great recipes for every chilli, so you can spend the holidays cooking up a storm in the kitchen! Perfect for foodies who love a bit of heat! 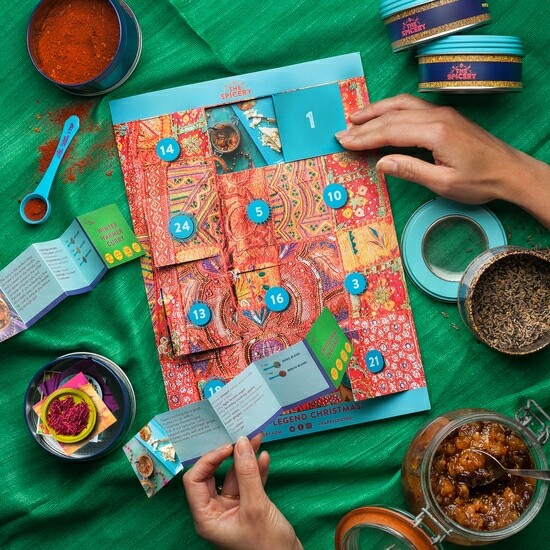 This Curry Legend Advent Calendar from The Spicery has twenty-four dishes for you to discover, with a different surprise Christmas recipe behind each door. Each dish can be made from combining the four special spice blends that come included. You’ll find yourself cooking great meals like Turkey Seekh Kebabs, Christmas Vegetable Bhajis, Vindaloo Pigs in Blankets and Jewelled Jeera Pilau Rice. A big part of Christmas is about spreading the festive cheer and helping those in need. The Lady Bamford Charitable Trust works with people living in disadvantaged communities across India, offering education and vocational training to both children and grown-ups alike. Ensuring that local women have a valuable skill to fall back on, the trust runs a fantastic stitching and embroidery centre in Ladiapur in Haryana. The women learn sewing techniques and make beautiful handmade gifts for Lady Bamford’s sustainable farming and wellness retreat, Daylesford Organic Farm. 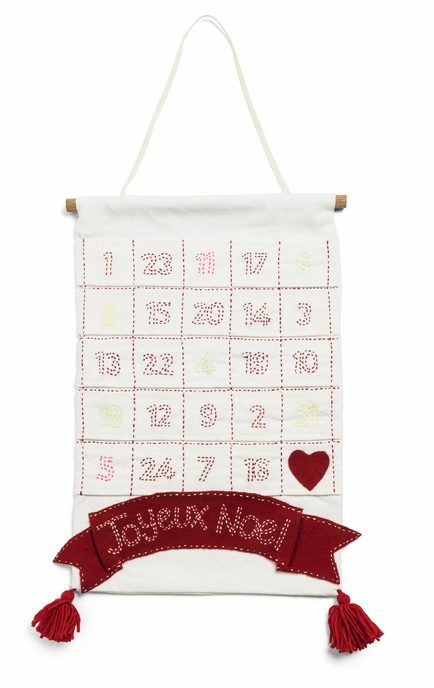 Support their work and choose from Christmas decorations, stockings and these wonderful embroidered advent calendars.